Crockfords Tower is the cream of the crop of the 6 hotels part of the mega integrated resort, Resorts World, developed by Genting Singapore and opened in January 2010. The resort boasts one of Singapore’s two casinos, Universal Studio, a water park, aquarium and the world’s largest oceanarium as well as plenty of retail and F&B outlets. The 9 story tall Crockfords Tower is an exclusive by-invitation only all suites hotel, with 120 lavishly appointed suites, mansions and villas. Thanks to my MIL we had a two-night stay in the luxurious 66 sqm Deluxe Suite Twin. On arrival you’re greeted by a grand entrance with polished marble floors and a stunning arc roof with the the impressive glass blown pieces “Armonia Chandeliers” by Dale Chihuly that run down the centre of the lobby that immediately sets an opulent tone. Catering to CIPs (Commercially Important Persons) and VIPs, Crockfords Tower is the closest hotel to the Resorts World casino. Our Deluxe suite combine sleek modern aesthetic with warm sumptuous materials and deep rich colors. Filled with custom-designed furniture, the lounge is definitely spacious enough to comfortably fit a few visitors. There’s a small kitchenette to the side of the lounge that comes with a generously filled mini-bar, coffee machine and probably more unique, a wine fridge. Inside, you’ll find the bedroom and oversized bathroom. In general, the interiors reflect contemporary early 20th century luxury and offers a sensuous experience. The real gem of the suite is the inviting bathroom that features a large bath for a relaxing dip and a rain shower that doubles up as your personal steam room. Bespoke Crockfords Tower towels, bathrobe and ESPA London toiletries adds further luxe. In general, the interiors display a level of personalised luxury and pampering, conveying a sensuous experience. There’s a good selection of restaurants available at Resorts World, from food courts to hatted fine dining. Crockfords Tower has its own feature restaurant – Feng Shui Inn (风水廷), serving fine dining Cantonese cuisine. We tried both lunch (yum cha) and dinner there, and being Cantonese, I get extra picky with Cantonese food. Considering the price, yum cha at Four Seasons Hong Kong’s Lung King Heen or dinner at Cordis’ (previously Langham Place) Ming Court or even Waldorf Astoria Shanghai’s Wei Jing Ge would make a much better choice, but then this was in Singapore. Crockfords Tower guests are welcome to use any of the pools at Hotel Michael, Hard Rock Hotel and the Festive Hotel as well as the gym at the Hard Rock Hotel, but these facilities can get busy at times. That’s when Crockfords’ own private outdoor swimming pool, which is probably one of the least used pools at Resort World, come in handy. On the way to the outdoor pool you’ll walk pass the Villas, a.k.a the crème de la crème, featuring 228 sqm of pure luxury that comes with its own spa treatment room, lounge pool, and 24/7 butler service. I do wonder, how much you’d have to “play” to get an invite to these Villas? Having stayed at a few of the Resort World hotels, no doubt Crockfords Tower is by far the best, but there are plenty of options on Sentosa and beyond. 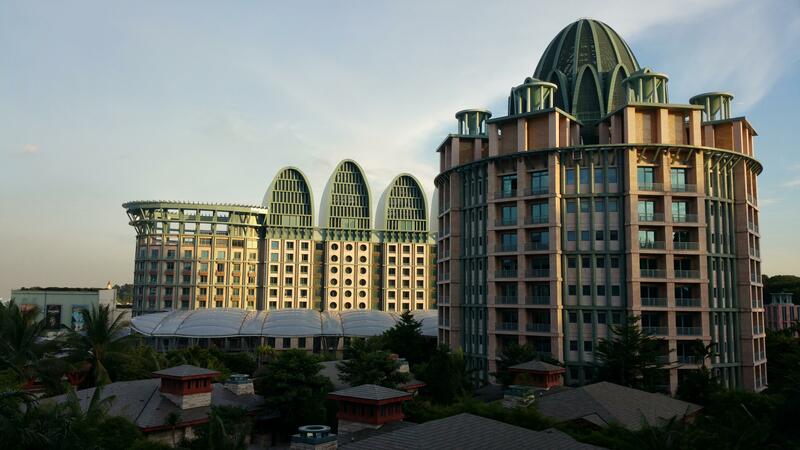 Check out my posts on the Mövenpick Heritage Hotel, Marina Bay Sands and Mandarin Oriental Singapore.